No resistance exists ( SEE CHART ) until that old high is reached. We feel that inflation is back driving the price of gold higher taking the miners with them . 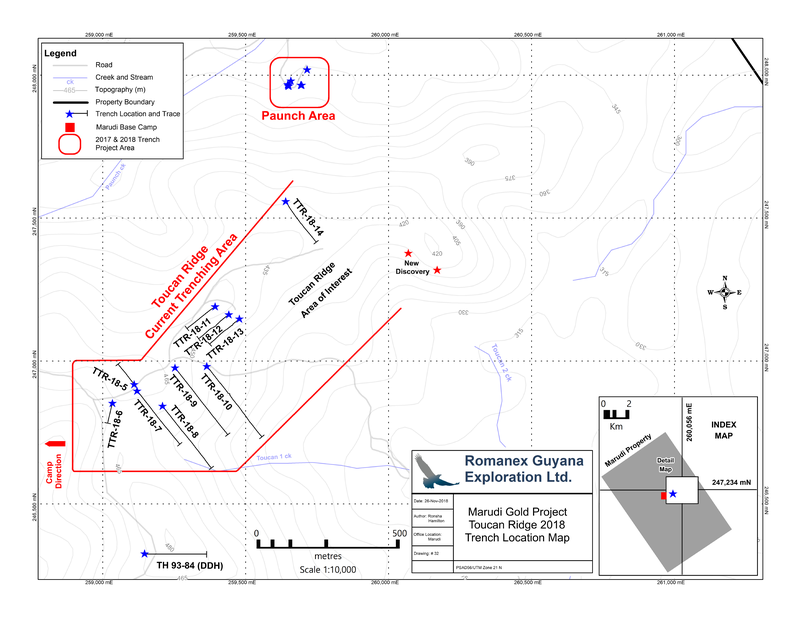 December 7, 2018 / TheNewswire / Vancouver, Canada - Guyana Goldstrike Inc. (the "Company" or "Guyana Goldstrike") (TSXV: GYA, OTC: GYNAF, FSE:1ZT) is pleased to report that the technical team has completed sampling and mapping of trenches TTR-18-15 and TTR-18-16 in the New Discovery Area at Toucan Ridge on its Marudi Gold Project ("Marudi" or the "Property") located in the Guiana Gold Belt, Guyana, South America. Trenches TTR-18-15 and TTR-18-16 are located approximately 1,150 metres northeast of trench TTR-18-06 along Toucan Ridge in the new discovery area. TTR-18-15 was trenched to a length of 159 metres and 72 samples were taken. TTR-18-16 was trenched to a length of 97.30 metres and 54 samples were taken. 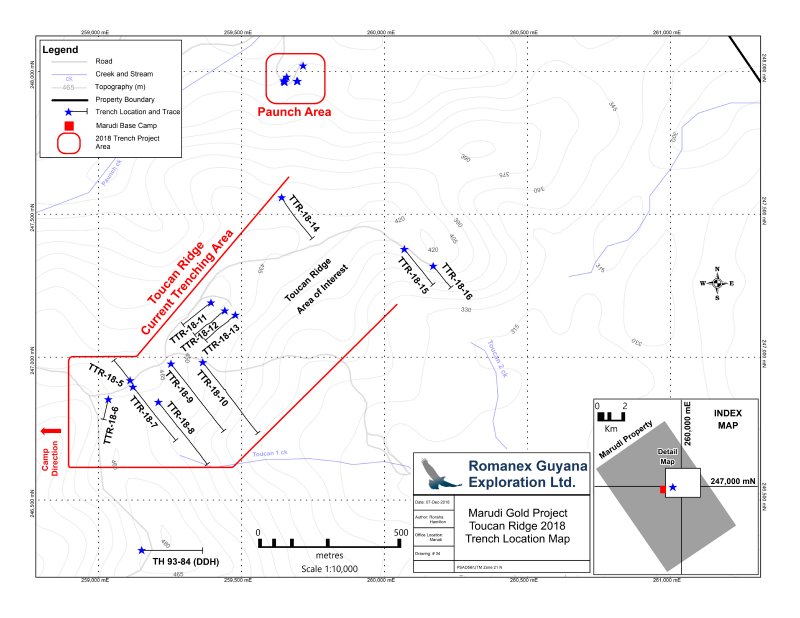 The technical team continues to trench along the ridge's 1.75 kilometre area of interest. Please view below, "Toucan Ridge Location Map" for the Toucan Ridge area of interest, and all trenching performed at the ridge. On November 28, 2018, the Company announced a new discovery of quartzite-metchert (host rock) at Toucan Ridge. Large fragments of angular host rock float are present in a 250-metre length along the crest of a spur ridge that descends to the southeast from Toucan Ridge. This discovery is approximately 1,150 metres northeast of TTR-18-6 which is the westernmost trench on the ridge. A total of 2,458 metres of trenching has been completed and 837 samples taken at the Toucan Ridge area. The area of interest continues for more than 1.75 kilometres to the east of trench TTR-18-06. To date, a total of 12 trenches have been completed within the area of interest. Trench sites are planned where quartzite-metachert is exposed or interpreted to occur beneath the transported overburden.